Kelly Albornoz wants to put herself out of business. Kelly hopes a drug-free technique will help all East Gippsland smokers to quit and if she succeeds, she’ll run out of clients. But that’s fine with Bairnsdale-based Kelly as it will mean a healthier population. Kelly is also a talented photographer and has a photography business. Kelly studied environmental science at Deakin University in Warrnambool, where she also researched whales and visited Antarctica three times. While there, she honed her skills as a photographer and was inspired to create Albatross Photography & Design, named after birds that followed her ship. More recently, Kelly turned her hand to helping people quit smoking. 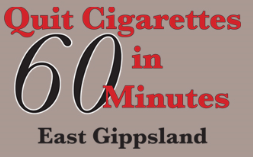 Quit Cigarettes in 60 Minutes combines Hypnosis with Neuro-Linguistic Programming (NLP) techniques that create new habits and focus on the positive consequences of quitting, such as improved health and saving an average of $6000 a year. The program costs the same as a month of cigarettes for a 20-a-day smoker and is covered by a lifetime guarantee. If a client starts smoking again, they can come back for free. Kelly, who gave up smoking cold turkey, trained in NLP several years ago. As a science graduate she was impressed by its methods and believed they could help smokers, including her mother, quit cigarettes and improve their health and finances. Kelly completed the Quit Cigarettes in 60 Minutes training while pregnant with her first baby. But she shelved the idea after losing the baby at 28 weeks. Friends and family had also discouraged her, saying the business would never work. Each four-hour workshop was followed by a mentoring session with an SBMS mentor, in Kelly’s case Bruce Hall. Bruce is a Small Business Institute director and has been a small business mentor for more than eight years, during which time he has worked with more than 1100 businesses. His specialities include personal development, marketing and e-marketing. • Completed a detailed business plan. Kelly intended to work one day a week, but as word spread she soon achieved her client goals and even had one travel from Melbourne after she helped his mother quit smoking. After taking leave to have her second baby, Kelly started building a consulting room on her property, which meant she no longer had to rent a room in town. The business is going extremely well and she hopes to significantly increase client numbers in her second financial year. Almost all of her clients have successfully given up cigarettes, so Kelly is well on her way to putting herself out of business. Bruce is full of praise for her talent, determination and organisational skills, but most of all her altruistic motives. “Kelly has a genuine desire to help people quit smoking,” he says. “Her motivation is not about making money - although that is clearly important - but to improve the health of people in the East Gippsland area. Kelly is focussing on Quit Cigarettes but has found time to continue her photography business and has several clients, including local real estate agents. Women in Business gave her the confidence to manage both with tips such as a “Time Bucket” to calculate how much time she can allocate to each task. This also reduced her stress levels. Bruce says Kelly now has well-honed business skills and is a talented and experienced photographer. Her science background is also a plus.